BD solutions, including flow cytometers, software, conjugated antibodies, and services, are designed to support the rapid pace of discovery in T-cell research. 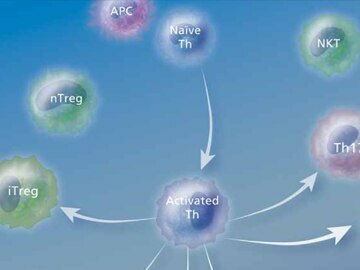 Our solutions for T-cell identification, transcription factor expression, as well as cytokine secretion and measurement, reflect a commitment to high quality and consistency needed for advanced research. To meet customer requirements,a range of choices is offered, from complete kits for phenotyping and sorting to fully customized formulas. More on IL-17F and T-bet antibodies and kits to simplify Th17/Treg phenotyping, regulatory T-cell sorting Kit, and T-cell activation. Cytokine detection, cytokine expression in naïve, memory, and effector T cells, intracellular cytokine analysis, and CD4 IFN-γ responses.